Raglan Holiday Park is located in the laid back coastal town of Raglan on a peninsula in the Raglan Harbour. Our Raglan holiday park is the perfect spot for your camping holiday. We are just 48km west of Hamilton, a 45 minute drive; and 2-2 ½ hours from Auckland. 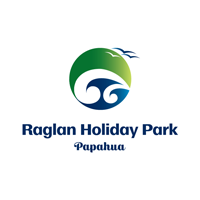 Please click here for more information on your Raglan accommodation options at our holiday park.